This comprehensive, standard work has been updated to remain an important resource for all those needing detailed knowledge of the theory and applications of vacuum technology. 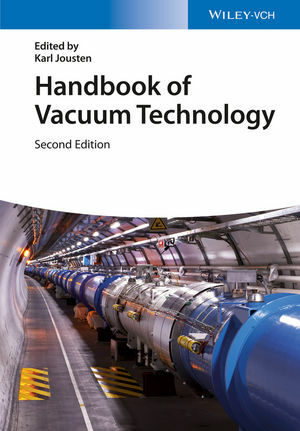 The text covers the existing knowledge on all aspects of vacuum science and technology, ranging from fundamentals to components and operating systems. It features many numerical examples and illustrations to help visualize the theoretical issues, while the chapters are carefully cross-linked and coherent symbols and notations are used throughout the book. The whole is rounded off by a user-friendly appendix of conversion tables, mathematical tools, material related data, overviews of processes and techniques, equipment-related data, national and international standards, guidelines, and much more. As a result, engineers, technicians, and scientists will be able to develop and work successfully with the equipment and environment found in a vacuum. Karl Jousten is head of the section Vacuum Metrology at the Physikalisch-Technische Bundesanstalt (PTB), the German National Institute for Metrology. He obtained his masters and Ph.D. degree in physics from the University of Heidelberg. After working as a post-doc at the Max-Planck-Institute for Nuclear Physics in Heidelberg, at the Oregon Graduate Institute of Science and Technology in the United States, and finally at the Fritz-Haber-Institute in Berlin, he joined the vacuum group at PTB in Berlin in 1990 that he leads since 1992. He has authored many scientific articles in the field as well as contributions to textbooks and edits the German edition of this book, "Wutz Handbuch Vakuumtechnik". He is active in the field of national (DIN) and international (ISO) standardization in vacuum technology. From 2005 to 2008, Karl Jousten has served as President of the German Vacuum Society. Since 2005 he chairs the international working group for low and very low pressures of the respective committee (CCM) of the Meter Convention. This book is based on both the first English edition and the 11th German edition of "Wutz Handbuch Vakuumtechnik", edited by Karl Jousten. There will be new content which has not been published before. Several chapters have been significantly revised. - Chapter 14 will describe new devices as the new ion trap analyser and plasma assisted analysers. - Chapters 15 will contain new material on dynamic vacuum. - Chapter 18 has been renamed to vacuum systems, and significantly modified by the editor. There are two new sections on the calculation of operating vacuum systems, and pressure control.